Arabisk: Stat, der regeres af en sultan, eksempelvis. Ahmednagar Sultanatet -Indien - 1490-1636 - Cowley, Cecil: Tales of Ahmednagar. - Bombay: Thacker, 1919. - 112 s.
Aussa, Awsa eller Assaw Sultanatet - Djibouti, Eritrea, Etiopien - 1734-? Bidar Sultanatet - Indien - 1492-1619 -Yazdani, G.: Bidar Its History And Monu-ments. - London : Oxford University Press, 1944.- 519 s.
Early period, p. 3 ; Muslim conquest, pp. 3-4 ; Zafar Khan, founder of the Baihmanl dynasty, made Bidar one of the four provinces of his kingdom, p. 4 ; Bidar a nourishing town during the reigns of the early BaihmanI kings, p. 5 ; transfer of capital from Gulbarga to Bidar by Ahmad Shah-al-Wali, pp. 5-6 ; Bidar during Shad 's rule, pp. 6-7 ; 'Ala-ud-Din Ahmad, a cultured monarch, he built a large hospital at Bidar, p. 7 ; reigns of Humayun and Nisam Shah, pp. 7-8; Mahmud Gawan appointed Prime Minister, his services to Nizam Shah and Muhammad Shah III, pp. 8-9 ; Mahmud Gawan's execution, p. 10 ; reign of Mahmud Shah and the disruption of the BaihmanI kingdom, p. 11 ; Qasim Barld, the minister, de facto ruler, p. 11 ; the four nominal successors of Mahmud Shah BaihmanI, pp. 1 1-12; Amir Band succeeded his father, Qasim Barld, in A.D. 1504, war with Isma'Il 'Adil Shah, pp. 12-13 ; Amir Band died in A.D. 1542 and was succeeded by his son 'Ali Band who was the first of the family to adopt the title of Shah, p. 13; 'Ali Barld joined the confederacy of the Deccan kings in the expedition against Rama Raja of Vijayanagar in A.D. 1565, pp. 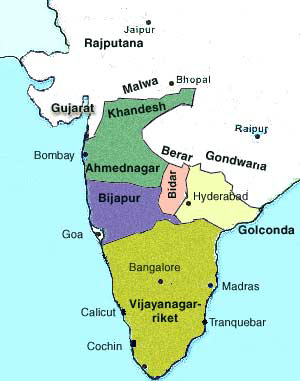 13-14; the rival dynasties of Bijapur, Goloonda, and Ahmadnagar become too powerful for Baridi kings after the battle of Tallkota, p. 14 ; the kingdom of Bidar reduced to a small principality and ultimately absorbed in the Bijapur territory, in A.D. 1619, p. 14; Aurangzeb conquered Bidar in A.D. 1656 and renamed it Zafarabad, p. 15; Iftikhar Khan the first Mughal governor of Bidar, A.D. 1656-8, p. 15; the successors of Iftikhar Khan until Asaf Jah declared his independence in the Deccan in A.D. 1724, pp. 16-17 ; Bidar fell into further insignificance after the establishment of the Asaf Jah dynasty, its governors occupying the position of divisional officers, p. 17 ; the subehdar of Bidar until A.D. 1846, pp. 18-19; with the introduction of the Ziladari system Bidar dwindled to a still lower position, pp. 18-19 ; the signs of revival under the present Nizam, p. 20. Sultanatet Bima - Buddingh, Steven Adriaan: Neêrlands-Oost-Indië. Reizen over Java, Madura, Makasser, Saleijer, Bima, Menado, Sangier-eilanden, Talau-eilanden, Ternate, Batjan, Gilolo en omliggende eilanden, Banda-eilanden, Amboina, Haroekoe, Saparoea, Noussalaut, Zuidkust van Ceram, Boeroe, Boano, Banka, Palembang, Riouw, Benkoelen, Sumatra's West-Kust, Floris, Timor, Rotty, Borneo's West-Kust, en Borneo's Zuid- en Oost-Kust; gedaan gedurende het tijdvak van 1852-1857 (1859). Welch, Anthony. 1996. A Medieval Center of Learning in India: The Hauz Khas Madrasa in Delhi. In: Muqarnas Volume XIII: An Annual on the Visual Culture of the Islamic World. Gülru Necipoglu (ed.). Leiden: E.J. Brill. Fadhli Sultanatet, Aden, Yemen - 1670?1968 - al barq alyamani fi al fateh al othmani (arabisk, 1967). Gujarat Sultanatet - Gujarat, Indien - The history of India as told by its own historians: Forming a sequel to Sir H.M. Elliot's History of the Muhammadan Empire of India. - London: W. H. Allen, pulishers to the India Office, 1886. - 599 s.
Sammenslutningen af Sultanater i Lanao / Confederation of sultanates in Lanao, herunder Baloi, Bayabao, Masiu og Unayan - Mindanao, Filippinerne. Sultanatet Langkat - Sumatra, Indonesien - Anderson, John. Mission to the East Coast of Sumatra: In M.DCCC.XXIII, Under the Direction of the Government of the Government of the Price of Wales Island [Penang]. - W. Blackwood; [etc., etc . ], 1826. - 461 s.
Sultanatet Sulu - Filippinerne, Indonesien - 1457-1851 - Saleeby, Najeeb Najeeb Mitry: The history of Sulu : Ethnological Survey for Philippine Islands. - Manila : Bureau of Printing, 1908. - 297 s.
Pettigrew, Richard Franklin: Treaty with the sultan of Sulu. Information concerning the Philippine islands (1900). - 15 s.
Se også: Emirat ; Islam ; kalifat ; monarki ; ophørte stater ; teokrati. Tyrkiske breve : fire beretninger fra Süleyman den Prægtiges hof. / : Ogier Ghislain de Busbecq ; med træsnit af Melchior Lorck ; oversat fra latin af Claus Asbjørn Andersen ; indledning af Claus-Peter Haase og Mikael Bøgh Rasmussen. Vandkunsten, 2010.